Difference Between Dust Mites and Bed Bugs - What Bit You? Difference Between Dust Mites and Bed Bugs – What Bit You? Size: Up to 5mm. Can be seen with а naked eye. Diet: Feeds on your blood. Bites you at night while you sleep. Habitat: Lives near your bed. It may be in your mattress or spring box. Health hazard: Does not transmit diseases but allergic people can have a reaction towards their bites. 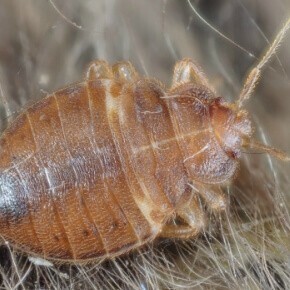 Visible to the human eye: Bed bugs can be seen with a naked eye. They are just very small. Size: Up to 0.5mm. Microscopic creatures that you'll never be able to see with a naked eye. Diet: They feed on house dust and your dead skin cells. And your pet's dead skin cells. Habitat: They can live in your mattress, upholstered furniture, carpet. Health hazard: Not a direct thread. They don't bite people. Problems may occur when you breath in their dried faecal matter and a protein from their body parts and they get in your lungs and irritate them, which may cause asthmatic symptoms. Visible to the naked eye: No, you cannot see dust mites with a naked eye. Are Bed Bugs or Dust Mites Parasites? First of all, what is a parasite? The definition states that this is an organism that lives and benefits from another organism at its expense. Parasites can use the other organism for shelter, for food, and for reproduction. Either way, the parasite needs a host to survive. Bed bugs fit the definition of parasites. They do not stay attached to the host, but live near it and feed on the host's blood at regular intervals. Dust mites, however, do not fit the definition. They do not need a host to survive and feed on. Dust mites are incapable of biting people or animals. They feed on the dead skin cells we all shed, but they do not have direct contact with another organism. What are the Differences Between Symptoms of Bed Bug Bites and Allergic Reactions to Dust Mites? Are They Dangerous? As a difference number one, we can say that dust mites DON'T bite. They can't. 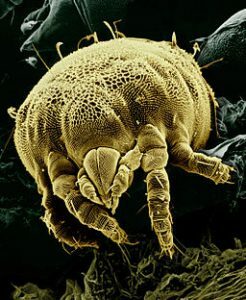 Dust mites don't have teeth or a mouth to bite you with. It is not dust mites bites that you get allergic reactions from. It's from their faeces and a protein from their bodies that you breathe in that cause health problems. Bed bugs will bite you and not only once. They feed on you every couple of days. Rarely do they cause major health problems but to people susceptible to allergies they can have some influence and cause skin irritations, blisters, asthma or other breathing problems. More often you will notice red welts but they can appear days after the biting. With bed bugs bites the symptoms and problems differ from person to person. Some people don't even show symptoms or have welts. You may not feel the bed bugs biting you but you will feel the bite marks when and if they appear. The bed bugs bites will be itchy but you should avoid scratching them as much as you can. If you scratch the itchy bed bug bites or skin eczema caused by an allergic reaction to dust mites, they may turn into scars. But if you leave them be and go away on their own, you won't have problems with scars. 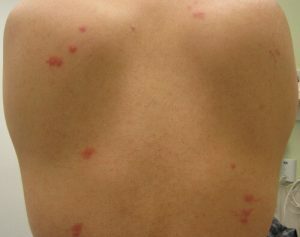 If the welts look like they are in a line, a cluster or some kind of a pattern, then you have bed bugs bites. If you are experiencing a dust mite allergy, the symptoms to be aware of are skin eczema, dermatitis, rarely hives or rashes. You can also have a runny or stuffy nose, cough, sneeze a lot, or have difficulty breathing or asthma. What To Do In Case You Have an Allergic Reaction to Dust Mites? Neither bed bugs nor dust mites transmit diseases to people. However, they can cause a number of serious health problems to people with allergies. You should also avoid dust and dust mites if you are pregnant because a study shows that if dust mite remnants get into the mother's organism they may reach the baby and increase the risk of the baby developing an allergy. The symptoms can be mild to severe. If the symptoms are mild and go on for more than a week, visit your doctor to determine if it is a dust mite allergy or a regular cold. Runny or stuffy nose. Which gets worse in the mornings and evenings. Nasal congestion or postnasal drip. Rarely skin redness or hives. These symtomps are more likely to occur to people who already have asthma or allergies to dust mites. Having allergic people in your family. Being exposed to dust mites on a regular basis and at high levels. Children and young adults are more susceptible to developing an allergy. Inspect the room and house for bed bugs. Look for faecal matter from bed bugs. It will look like black dots on your bed linen or mattress. Shed skin or eggshells from bed bugs is also a tell-tale sign of bed bugs. Look for them near your bed. If you can catch an individual, bring it to a specialist to determine the species of the bug. Vacuum thoroughly the bedroom and around your bed. Wash all of the bed linen at high temperatures and if you have a dryer, use it. Don't panic if you find out that your home has bed bugs. Don't go sleeping in another room. Don't throw away your mattress unless the infestation is severe. Don’t use bug bombs or other pesticides. Don't try DIY methods for dealing with the bed bugs. Don't wait too long before calling a professional exterminator. Will Any of the Pests Attack Your Pets as Well? Bed bugs will feed on your pets if there is no human nearby. Bed bugs are drawn to the carbon dioxide that people and animals exhale and that's how they find you. If they are searching for food and your dog or cat is the only one near them, bed bugs will feed on them. Dust mites feed on the dead skin cells of animals as well. Is It Possible That Just One Person Gets Bitten? No. Bed bugs don't have preferences in blood types, like it is believed that mosquitoes do. They search for food and find the nearest host to feed on. The fact that only some people get symptoms such as welts and red blisters means that their bodies react to the bites. Every person's body has a different reaction to the bites. It is more likely that everyone is bitten but not everyone's body shows a reaction to the bites. There's really no way to keep your home 100% mite-free. But with regular cleaning of the entire home, you can reduce their number. Vacuum your mattress, carpets, area rugs, upholstered furniture, even curtains regularly. Dust daily and keep humidity levels low because the mites thrive in humid areas. If you are more sensitive you may encase your mattress. Regularly vacuum of the upholstered furniture, carpets and mattress. Washing bed linen weekly at high temperature can help reduce their population. Be careful when you are travelling. Keep your luggage safe and inspect the hotel rooms you are staying in.